I have a confession… and this one is pretty hard to admit. If you’ve been around here before, you know I like routine. It’s how I function best. It wasn’t too long ago that I realized I’d been avoiding some pretty serious daily routines. I let them slip to the back of my mind until I had no choice but to pay attention. It started with a terrible dentist appointment for one of the kids. It wasn’t just the unexpected dental work that slapped me in the face… it was the realization that I was almost standing in the way of good dental health. What?!?! We’ve always brushed our teeth (of course) but it wasn’t planned into our routine in a way that worked. That meant tooth brushing time was a drag, a chore AND rushed. What comes from something that is a drag, a chore and rushed? Hmmm, I think we all know the answer to that. So I did what I do best. I made a plan. We quickly took that plan and created a routine that has been working for months now. Once we had tooth brushing under way I realized that there were other important daily tasks that were falling through the cracks. We went full force on those and now, instead of feeling overwhelmed and guilty about what I’m not doing. I feel empowered and excited about how many healthy routines we will be able to tackle! Today I’ve teamed up with ProNamel® to spread the word about their kid’s line. ProNamel® 6-12 Years Toothpaste for Kids is focused on kids age 6-12, who are in the stage of losing their primary teeth and growing in their secondary teeth. It actively strengthens enamel and helps protect against everyday acids and cavities. Pick One Routine at a Time. They are all important. That’s a fact, but if you try to change everything at once you’ll go crazy and then none of them will stick! So pick one thing and figure out how to make it fit. Play with it for a couple of weeks and when you start to feel like it’s just naturally happening without much thought… pick something new to focus on. Plan. 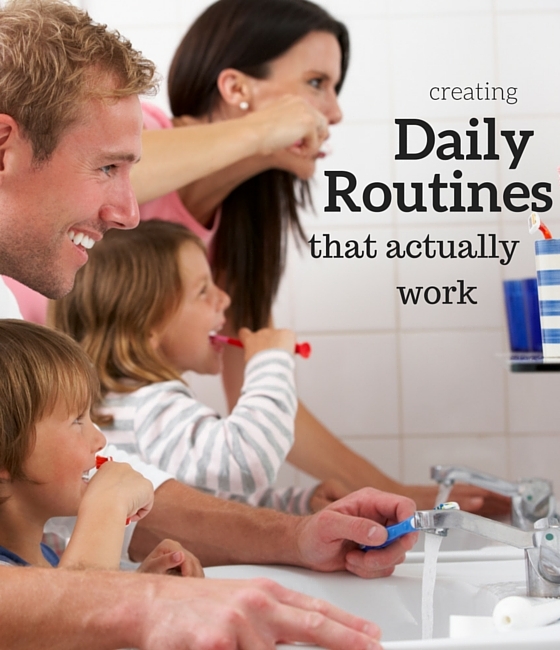 Routines will stick so much better if you are invested and fully on board. Knowing ahead of time what time of day will be best, where in the house will be best and which parent should be in charge; will help the kids get on board when you’re ready to put your plan into action. Set Up the Environment. Think about the environment and plan accordingly. Make sure that everything you need for these daily routines is in reach and in sight (especially if visual reminders are important for you). I know seeing them will make remembering much easier for me, especially in the beginning. Think about Challenges. Take some time to think through the obstacles you are bound to face. One of the problems with our tooth brushing was the obvious discrepancy of how long 2 minutes actually is. We ended up getting a toothbrush timer but before that I used the stopwatch on my phone. Start on the Right Foot. 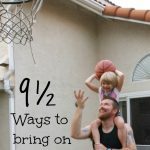 It’s pretty likely that your kids are not going to be excited about adding these important routines into the mix, but you can make it more fun. Allow yourself enough time (especially in the beginning) to be relaxed about it. Get silly and have fun. Tell a tooth joke when the job is done or draw letters on their back while applying lotion. Just because something has to be done doesn’t mean it has to be boring. Check Back. Every couple of months check back with the routine. Is your original system still working? Does it need tweaking? Settings kids up for ‘tooth successes’ for the rest of their lives is easy! By preventing Acid Erosion during this crucial time ProNamel® 6-12 Years Toothpaste for Kids works to actively strengthen the precious enamel kids have now. Kids between 6 and 12 years old are susceptible to Acid Erosion and experience enamel erosion – and once it erodes, it never grows back. 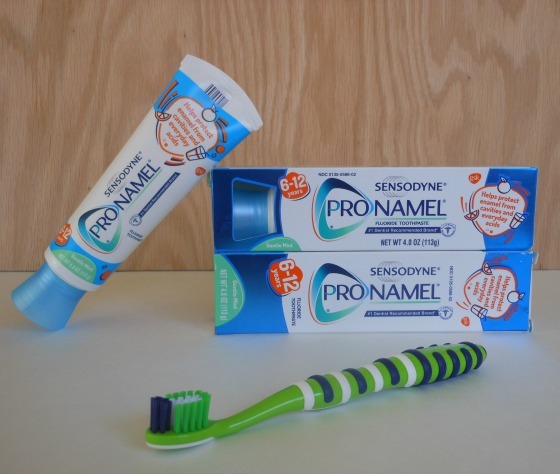 ProNamel® for Kids is specially formulated to protect against cavities and everyday acids. ProNamel® is the #1 Dentist Recommended Brand for strengthening and protecting enamel. Find ProNamel® online – Pinterest, Twitter and YouTube. Coupons available on the ProNamel® Website. What healthy routine do you need to improve? Tell me in the comments and you will be entered to win a $100 Visa gift card! I need to improve the amount of time i spend working out. I need to improve more yoga poses and Pilates. We need to improve my children’s brushing of their teeth. We just went to the dentist, and no cavities, the doctor did say they need to slow down and pay more attention. I want to get better about getting the entire family active outside. We need to improve our shower and bedtime routine. Since the kids have gotten older, we have given them more independence, but that resulted in delayed routines and rushed activities that aren’t being executed well. We have a real problem with yucky, partially brushed teeth. ?. What a timely article! My daughter has issues developing her tooth enamel, so it’s critical we get the tooth brushing routine nailed down…twice a day. Mornings are my nemesis, so that’s the routine I’m going to tackle! Thanks! I need to improve putting things away like clothes or books! I need to work on flossing on a daily basis. My family and I need to work on our general bedtime routine, which somehow needs to include time to “wind down.” By the time the kids are supposed to be brushing their teeth, they are running around, hitting each other, etc. It’s no wonder they don’t do the best just with the teeth brushing! I need to get to bed with enough time to fully recharge so I can have more focus during my waking hours. I need to work on getting enough sleep: I like to stay up late when all have gone to bed to get more things done around the house. I need to improve on our getting enough exercise and getting rid of all the sugary treats in the house. Candy and sugar treats cause too much tooth decay, and make sure to brush 3 times a day! I need to get my kids to floss more regularly. My son brushes twice a day but he needs to do a more thorough job. I need to improve our exercise routine. My family needs to be better about brushing our teeth longer! We usually only brush about 20 seconds vs 2 minutes at a time. I need to get my kids to floss daily, they tend to skip this step. We could improve a little on healthier eating. We eat healthy for the most part but sometimes when in a rush, I just go for what is easiest but maybe not the healthiest. I would love to improve on healthy eating and organization. We need to improve the nightly wind down to bed routine, which includes teeth and settling into bed to get the most rest possible. Middle schoolers seem to still be wired for longer even though they are TIRED! Keep trying new things and see what works best with your family and kiddos! I need to start going to bed earlier. My child finally is sleeping better but sometimes it’s so nice to have some quiet time to myself that I stay up way later than I should which makes me sleep deprived the next day! It’s a work in progress! I need to improve planning ahead with healthy lunch options instead of grabbing whatever in a moment of hunger. We need to floss more on a regular basis. I really need to make sure I floss twice a day. I am good at the morning flossing but I often do not take the time to floss at night. Brushing in the mornings! We are great at night, but rushed every morning. We need to improve on our regular fitness routines. We need to cut sugar in our house or at least cut back on it. I need to get more active. Any free time I get I’m so darn tired, but I need to keep moving! I need to schedule more time to run. I run a daycare and with a child of my own it is really hard to find the time. I need to pick a set time of the day and stick with my schedule. I need to improve my posture and improve on healthy eating. I especially need to get more calcium. Definitely need more exercise!! A regular workout and/or walk time scheduled through the week. I’m more of a hit and miss exerciser. I need to improve on eating meals at set times during the day, and also not eating two hours before bedtime. I have got to get better about flossing! I need to improve out eating, we lack healthy foods. I need to plan on paying more attention to brushing my back teeth. I need to improve on drinking more water! Especially in the summer! I need to improve my eating routine by eliminating junk food and soda. I need to improve my dental routine by going to a dentist. I also need to work out more regularly. I need to create and maintain a more consistent sleep schedule. I know that it would probably be a positive change if I maintained it for more than a few days. i need to improve by flossing every day! Make sure we get our teeth cleaned twice a year. Brush twice a day and don’t forget to floss. I think flossing is what we forget the most, that the most think we need to improve. I need to work on getting my kids to floss daily! I need to eat healthier. My son who is 16 months like to brush his teeth himself and I let him. I help also but he doesn’t like when I actually brush the top teeth. I need to just do it . I know in the long run it will be for the best. Thanks for the chance to win. I need to improve my sleep habits! Some nights I stay up way too late. I need to drink more water. I hate drinking water but I know I need to. I need to make reaching for produce instead of chips (or similar) my routine for snacking! I know the snacking isn’t going to stop, so it should at least be healthy! I really need to up my exercise It is something I am very neglectful of. I need to eat more vegetables. I brush my teeth twice a day as well as floss regularly; however, I need to improve on visiting my dentist more regularly for yearly dental cleaning and x-rays. I need to start exercising on a regular basis. I need to make healthier eating choices. I need to improve on drinking healthier juices. I need to change my water routine. I need to drink more each day so I can have beautiful skin like J.Lo. We need to work on getting the right amount of sleep. We fall short too often, and it’s not good for our health! Hand washing! With summer gone, fall coming on, and winter right around the corner, staying healthy is more important than ever. I need to cut back on the salt. I need to improve on getting more exercise. I need to get in the habit of healthier dinner time. Our goal is to sit down at the table and eat as a family consistently. I still need to improve my flossing schedule. I know I should really do it more often, and prompt my family to do the same. I need to improve my sleeping habits by going to bed earlier and waking up earlier. I need to work on a daily work-out routine. I used to do it, but got lazy and stopped. I need to get in an exercise routine! I am SO bad about “skipping it today”. I need add aerobics to my daily workout plan. I would like to exercise more consistently, so that I could drop a few pounds. I also try to eat more salads full of veggies. I need to eat less sweets! Its such a bad habit, and I should have more protein instead. More exercise/movement in our days. i need to start getting back into meditating and yoga. I need to improve my exercise routine. In fact, I need to make it routine! Ohhh, I definitely need to eat healthier.. I need to improve my diet to cut out sugar. I need to consistently be grateful for the opportunities presented on a daily basis. I really need to start flossing more! I need to work on brushing my teeth and the kids’ teeth twice daily. Washing my face twice a day! And going walking once more each week. 🙂 Setting new habits is hard! There is a lot I need to improve. Drink more water, exercise more and eat better are the top 3. I need to floss more and use my water pic more often! Cut out acid foods and tea! I need to work on making sure that I hit every part of every tooth when I brush! I need to work on cutting back on added sugar in my diet. I need to improve my flossing routine, I keep falling out of the habit! I want to improve on family dinner time together. By the evening, things are so chaotic and usually running behind schedule, so I’m happy just to get everyone fed. I wish we could sit at the table at least once a day together as a family to talk about our day. I need to improve my exercise routine. I had a mastecomy 12 weeks ago and have noticed I am out of shape and gaining weight. I need to improve taking more time to floss and really watching and helping my kids brush their teeth. I need to cut back on sweets. What healthy routine do you need to improve? I need to improve on serving healthy family dinners. Eating breakfast! I often skip it and then my body doesn’t get the morning nutrients that it needs! we are not great on flossing we need to get better at it….